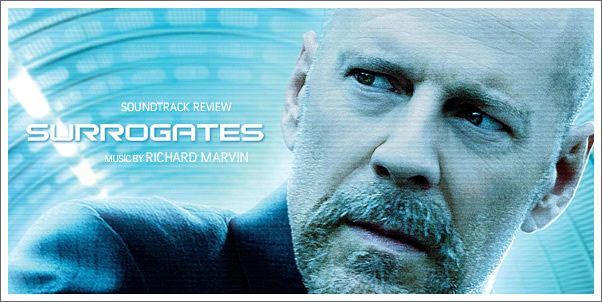 SURROGATES (2009) stars Bruce Willis as a die-hard cop. No surprise there. But there's a twist: he's a young Bruce Willis mannequin remotely controlled by the current aging Bruce Willis lying in a high-tech reclining chair. In that futuristic world, everyone has an ageless, beautiful model of themselves (called surrogates) interacting with each other, while their real, imperfect selves are hidden behind electronic circuitry and closed bedroom doors. Though the movie has car chases, foot chases, fights, and murders, SURROGATES is at heart a social commentary about the avatar-happy online community that hides behind usernames and other artificial façades. Most famous for U-571 and all five seasons of SIX FEET UNDER, RICHARD MARVIN has largely worked in television, scoring such popular series as WITHOUT A TRACE and a long list of TV movies. SURROGATES, directed by long time collaborator Jonathan Mostow, represents his second album release and composer credit for a big budget movie (after U-571). While U-571 (also with director Mostow) was generally well-received as a good listen, it was sometimes criticized for being too derivative of existing scores. This is not an uncommon ill to befall scores whose directors fall too much in love with temp tracks and may not reflect the creative vision of the composer. SURROGATES, then, is MARVIN's second chance to prove he's got the originality and presence for a major motion picture.